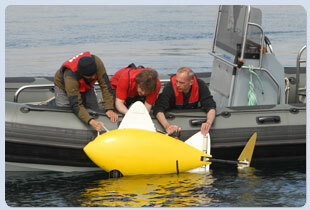 Robotic fish in sea trials. If it looks like a fish and swims like a fish, is it a fish? Not in this case, British consultancy BMT Group have been leading a project developing a robotic fish to aid in pollution detection with European scientists from different universities and organisations. Working as a shoal they can intelligently map and navigate an area, giving a second by second update of the quality of the water and even track down the source of any pollution it finds. An invaluable tool for any port authority or business that has discharge into a water course or marine environment. The project is actually called SHOAL and is the collaboration of the years of research and development that has gone into the various aspects of what make this such a good tool. 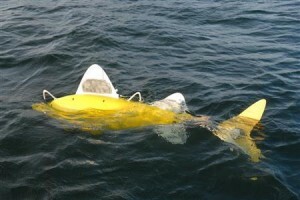 Using the latest robotics, artificial intelligence, chemical analysis, underwater communication and hydrodynamics they have managed to produce a robot that will blend into the marine environment and go about doing what it does best, taking on-board chemical analysis of the water it is swimming in and send that data back to the surface station, either by itself or through the shoal advanced communication system. We will be setting up satnav POI’s (Points of Interest) using POI Editor which can be found here http://www.poieditor.com/ for dive sites we visit. They will be downloadable as POI’s from divingjunkie.com on the overall map and you are free to share them with other divers. Included on the downloadable POI’s will be the dive shops with air refills and kit hire and any parking for that shop. On each location you will see an info box which you can click on the name and it will take you to that locations close up map showing the nearest car park, cafes, toilets, phone box; leading to the dive sites entry points.. If anyone feels we miss one they can use please let us know. If anyone would like to join the site and include their dive locations as POI’s on our map we would be happy to talk through the simple use of POIEditor as well as ensure a standardisation is met across all dive locations. We are doing this in good faith to share information about dive sites but if you choose not to download them from the originals stored here on divingjunkie.com we cannot be held responsible if they contain anything that could cause your satnav to fail. We hope that the diving community understand this and if they do share them, that we encourage, it is done so without tampering with the files. The files we upload will be virus scanned before we let them go live but while every effort is made to ensure they are safe for your computers and satnavs we cannot be held responsible for any tampering of the files that may occur after we have uploaded them. There are many dive enthusiasts and professionals on the internet with their individual websites showing dive locations and POI’s (Points of Interest). What we would like to do is to standardise what is a confusing array of information into one format. We accept we are new to diving so to speak, but we know the things we look for when at a dive site and their importance, nothing like a cuppa after a dive or the use of a public phonebox or nearby houses if there is ever an emergency and the mobile has no reception or a flat battery. This is why we feel it is important to make the visit to any dive site as easy and enjoyable as possible. We will be using Googlemaps for the top level map, and it is the map system used in the POI Editor for satnavs this is for ease of use digitally more than anything else. If an ocean bed survey, or maritime map is freely available for the dive site area we will be including this as well, with clearly marked out routes we have taken and danger zones for divers such as current directions, rips, boat traffic at surfacing points as well as SSI’s or areas that are illegal to dive.